While Anabaptists and Baptists believe in “Believer’s Baptism’, which is the Christian way of immersion stating that a man is baptized based on his or her calling of faith in Jesus Christ and as baptism is used as an entrance into a community of faith, both religions totally vary from each other. They didn’t start from a similar group, however a few Baptists are saying otherwise. Read on as this article further discusses their differences in certain matters. Anabaptism started from the Radical Reformation which transpired in the sixteenth century, while Baptists started with English Puritanism. Various feelings of traditional Anabaptists would seem, by all accounts, to be new to a Baptist as they have different ways and means in their sect. Anabaptists also believe that the demonstrations of graciousness and discipleship are needed in life. The nearest relatives of Anabaptists are the Amish and Mennonites. Their point of view of the Bible promotes the conviction that the New Testament supersedes the Old Testament. They believe in separation from the world which is the reason Ancient Amish rule out having power of electricity in their homes. People won’t see the Amish running for political office as this activity perverst their belief in separation from the world. Baptists began as a branch of Puritanism. While they too reject infant baptism, they don’t share in the belief of pacifism. They have also become well-known in the modern society. Baptists are not prohibited in running for political office, participate in war, and live their daily lives as normal people. They see both the Old and New Testament as counterparts and believe in justification by faith in Jesus Christ alone. Southern Baptists have roots, mostly, to the Protestant Reformation that rose in Germany and Switzerland in the sixteenth century. 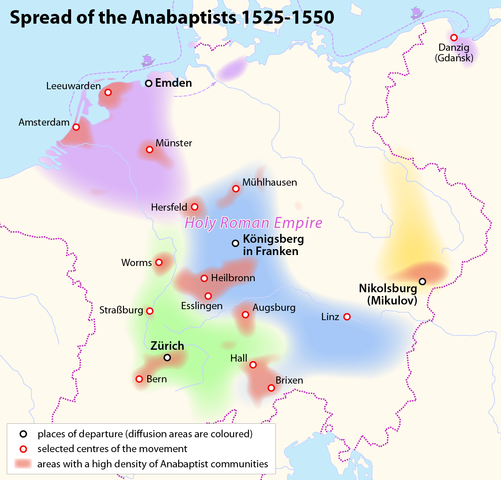 Anabaptists were one of the standard clusters that rose in Europe in the presence of Calvinists and Lutherans around at that point. The word “Anabaptist,” according to the Online Etymology Dictionary, connotes “one who cleanses through water again” and this word was associated to the Anabaptists by their persecutors. Anabaptists over the long haul fan out into a couple of exceptional groups, including Amish, Mennonites, and Hutterites. Some of these associations hold the three focus Anabaptists feelings. 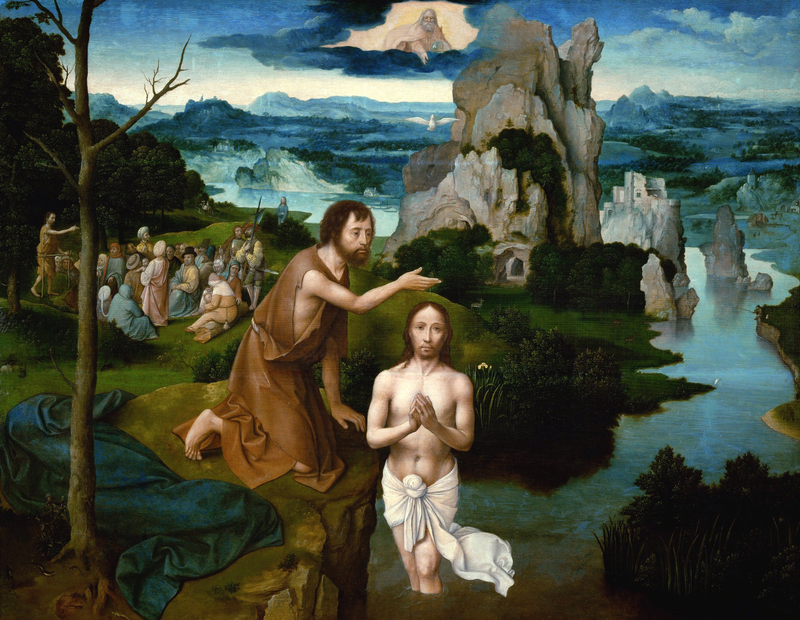 Anabaptists teach that a man should first put faith in the gospel before undergoing baptism. This in light of the scriptural lessons of Jesus Christ. In this manner, they don’t baptize babies. Baptist denominations, on the other hand, vary in their belief in baptism. Reformed baptists believe that babies can be baptized while Southern Baptists believe on baptism as similar to that of the Anabaptists. Anabaptists don’t believe in getting or securing rights through the use of electrical energy. They are centered around simplicity based on the teachings of Christ in the Sermon on the Mount in the New Testament. Unlike Baptists, having many denomintions, do not command their members to such extreme manner. Anabaptists believe all property should be shared in a comparative way as related disciples to Christ. This is according to Christ’s charge to rich energetic ruler to surrender most of his having a place and tail him. Two or three key differences exist among Anabaptists and Baptists in their control over their congregations. One critical differentiation is the implications of salvation by Baptists which they believe must be through faith in Christ versus an emphasis on discipleship or good works by Anabaptists. Salvation for the Anabaptists differ from Baptists, with the Anabaptists emphasizing good works in order to be saved, using the Bible as their standard specifically Sermon on the Mount of the Lord Jesus Christ while denying justification or salvation by faith alone which the Scripture also teaches. On the other hand, many Baptist denominations believe in justification by faith which is closer to the biblical teaching about salvation. However, there are many denominations in the Baptist religion and not all believe in justification by faith alone. Living clearly and disengaged from bunches is the lifestyle of various Anabaptist. They intend to detach themselves from the outside world. A couple of groups called “Amish” still use a stallion while voyaging. Some Anabaptist moreover don’t use control. A particular group called “Hutterites” live on a noteworthy estates and withstands on a conviction that there must be fundamental property. Impassioned people in these groups don’t hold political office or serve in the military. They get a handle on showing pacifism toward all people. Southern Baptists, on the other hand, fuse into their adjacent neighborhoods, towns, urban territories, states and countries. They get related with government and vigorously hold political working environments and serve in the military. Other Christian groups will wrongly tell you Anabaptists are Baptists, and it’s not helping when some Baptist theologians take after their motivation to Anabaptists. On a shallow view, it is definitely not hard to believe they are the same however a more basic look at their fundamental establishments and practices appear in a startling way. Julian Angelo. 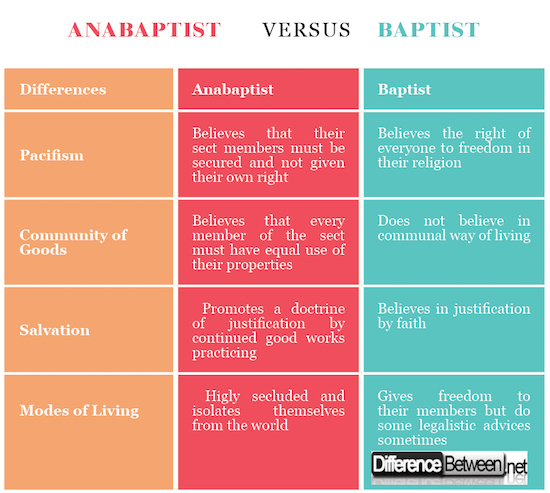 "Difference Between Anabaptist and Baptist." DifferenceBetween.net. April 5, 2018 < http://www.differencebetween.net/miscellaneous/religion-miscellaneous/difference-between-anabaptist-and-baptist/ >. I wanted to inform you that the difference table is very incorrect. For pacifism, Anabaptists believe in the pacifist vision; to not take up arms, live according to Jesus’ two greatest commandments (love God and love others) and after Jesus’ own pacifist example. As a Baptist, Baptists believe in Just War Theory; that God can call people to war, and Christians should take up arms if they are “called”. That belief is modeled after wars fought in the old testament by God’s people (Israelites), and clearly Jesus asked for a Christians to lead others to Christ without violence or force (because one must personally choose to let the Holy Spirit change them). Anabaptists (with the largest concentration being Mennonites, not Amish or Hutterite) are not all strictly communal or seemingly communist. They do not believe that good works is what justifies someone; works follows faith. James 2:17 reads, “faith without works is dead”. It is what follows conversion; Christians end up sinning less, reaching out more, loving others more (because it is a commandment from Christ). This page is very biased and from my personal experience, Mennonites and Baptists may seem similar, but Baptists believe that war can be justified by God, and Mennonites are more humanitarian and trying to go back to the roots of Christianity. “5 Beliefs That Set Southern Baptists Apart From Anabaptists” newsmax.com. 2018. Web. “What's the difference between Baptist and Anabaptist?” christianforums.com/ 2018. Web.